Hydroaysen dam project was finally cancelled by the Chilean governement on 10th June 2014, after 8 years of the campaign under the slogan "Patagonia Sin Represas"
In 2005 Endesa Chile S.A. announced a huge plan for energy generation where five large dams would have been built along the Baker and Pascua rivers in the Aysén Region, in the Chilean Patagonia. The project envisaged the flooding of about 6,000 ha of land and was controlled by the consortium Hidroaysén, owned by Endesa (since 2009 a subsidiary of Italian conglomerate ENEL), with a 51% stake and by Colbún S.A. which owns the other 49%. If completed, the companies would have owned 80% of the Chilean electricity market. The dams were planned to have a capacity of 2,750 MW with production of 18,430 GWh on average annually. The cost was estimated at 3.2 billion U.S. dollars, making it the largest energy project in the country's history. According to HidroAysén, the project could generate 21% Central Interconnected System's (SIC) demand by 2020. A high-voltage direct current will be built between Aysén and the capital Santiago to feed the SIC and will include a submarine portion between Chaitén and Puerto Montt. The hydroelectric project got a official approval on May 9, 2011 under the government of President Sebastián Piñera, despite huge mobilization and opposition by many groups from the civil society in Chile and abroad. A massive campaign, Patagonia Sin Represas, started since the first rumors about the project reached the public. Cultural personalities like Manfred Max-Neef and the writer Luis Sepulveda, and the Foundation Futuro Aysén, have endorsed the opposition campaign. The controversy was based both on environmental and social issues, due the heavy and unprecedented impacts on the region. Moreover, the plan for the transmission line was not even discussed, nor any plan was made public yet. The electricity would have gone mainly for the mining industry in the North of the country, particularly for copper extraction. Oppositors have strongly questioned the extractivist economy of Chile and denounced the colonial and pro-private law regulating water use (Codigo de Agua). Patagonia sin Represas and other groups such as Greenpeace have led the successful opposition, linking up groups in Patagonia with urban organization and social movements in Santiago. Contrariety to the project has also been repeatedly expressed by the bishop of Aysén, Luis Infanti, who openly asked the government to take into account and reflect upon economic, energy related, political and sociocultural aspects of the project. He argued that the decision cannot only be based on economics and econometrics but needs to have a broader perspective. In 2014 he sent to the government a branch of araucaria, the word meaning "tree of free people", and therefore a symbol of peace and freedom. The campaign has also jointly advocating for the scrapping of Hidroaysén and the withdrawal of the foreign companies with groups and organization in Spain and Italy, as Endesa and then Enel owned the majority of the project. Mobilizers and campaigners have managed to agglutinate under Patagonia Sin Represas (PSR) lots of urgent issues in the country, ranging from energy debate to education and corruption. They advocate for a systemic change in Chilean politics and have built strong alliances with students (for example in the huge student mobilization in 2011) and artists (see the many events and concerts organized under the PSR banner). On 10th June 2014, after 8 years of the campaign under the slogan Patagonia Sin Represas, the Bachelet government in Chile rejected the Hidroaysén project. The Committee of Ministers, the highest administrative authority of the country including the Minister of Environment, Health, Economy, Energy and Mining, Agriculture, and Tourism, evaluated 35 appeals filed by the Patagonia Defense Council, which were presented in response to the approval of the project’s Environmental Impact Assessment in May 2011, under the Piñera government. The reasons of the rejections were, among others, the absence of a regular resettlement plan for the affected communities and inhabitants of the region, poor assessment of environmental impacts and insufficient plan for the construction of the transmission lines. Project Details Five hydroelectric plants. All together would have a capacity of 2,750 MW (production of 18,400 GWh/year). The installation of more than 2,000 km of cabling and the construction of 6,000 pylons ranging in height from 50 to 70 metres. Hidroaysen claims to have spent 300 million USD until 2014, the total busget is said to be 3.2 billion USD. Endesa (Endesa) from Spain - Since 2009, Endesa has been bought by the Italian company ENEL. In Hidroaysén, Enel-Endesa own 51% of the project. The Council of Canadians launched a campaign aimed at stopping Canadian pension funds from destroying Patagonia Re:Common with Fondazione Banca Etica started financial activism in order to take part to the ENEL shareholders assembly with representatives of concerned communities for denouncing the impacts of Hidroaysén. Lots of concerts and music/artistic events have been organized in support of the campaign. Development of Alternatives Patagonia Sin Represas has always advocate for a systemic change in the energy production model in Chile. Non-conventional sources of energy (Energías Renovables No convencionales - ERNC) are one of the possible way out towards a real transition. This will also entail a reduction in consumption from the demand side, getting rid of a purely extractivist economy and the colonial past. Chilean economy should gradually shift towards the third sector and invest more and more in education and service. Why? Explain briefly. 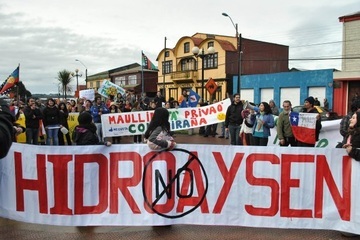 After 8 years of the campaign under the slogan Patagonia Sin Represas, the Bachelet government in Chile rejected the Hidroaysén project on 10th June 2014. Members of Patagonia Sin Represas in Chile and abroad have welcomed the announcement with great joy and well aware that this is the first step of a hill-up road towards a paradigm shift. El desconcierto; Política energético-ambiental del ¿nuevo ciclo?